How do you use STEM talent to help financially underserved people around the world succeed? Here’s one way…. 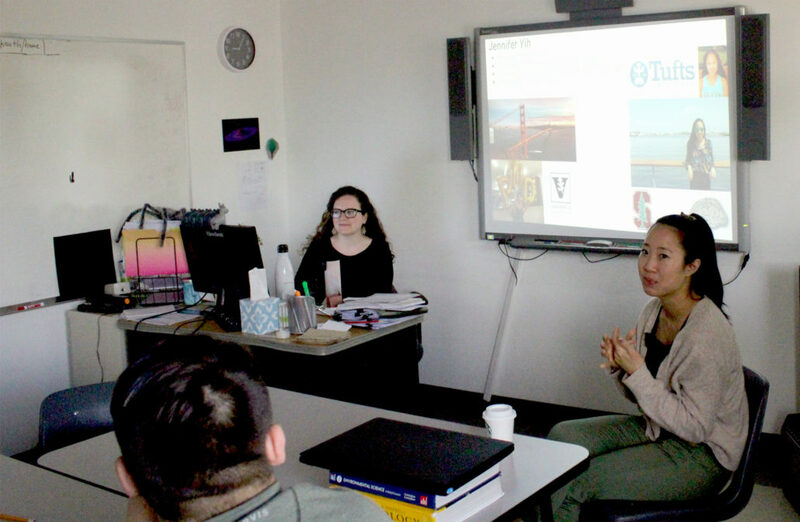 On April 8, 2019, STEM3 Academy students in Mrs. Sandie Reddy’s government class heard from Dr. Jennifer Yih on how she put her passions to work. With a Tufts BA and a Vanderbilt University Ph.D., Jennifer definitely had the skillset to make a major contribution with her STEM ability. She is also a big believer in making and holding on to mentors from different phases of her life, so she was able to talk about her dreams with people who cared and had the experience to guide her. Jennifer found her dream job as a Senior Behavioral Scientist at Tala, a Santa Monica startup, that provides micro-credit to individuals who are ignored by traditional banks. With just a 5-minute application that people complete from an app on their Android phones, people in Kenya, Mexico, Philippines, Tanzania and now India can access credit to start a business, pay a supplier, or even buy seed to plant their crops on time. The tool requires sophisticated & predictive data analysis to maximize success, and that’s where Jennifer’s talent is focused and her passion to help people fulfilled. So what does it take to become a Behavioral Scientist? Broadly defined, behavioral science is the study of human habits, actions, and intentions; it spans the fields of psychology, social work, human resources, economics, sociology, and organizational behavior. Behavioral scientists are able to choose their own unique career paths thanks to the wide variety of applications and panoply of available workplace settings. In short, a behavioral scientist is any individual who is well versed in psychometric methods and the social sciences, and who uses this expertise and interest to examine the observable actions of living beings. Many work to broaden the scientific understanding of human (and animal) behavior, and many work hands-on to address social or individual problems. For someone adequately trained and educated in behavioral science, the employment options are nearly limitless! A behavioral scientist must hold a four-year bachelor’s degree, preferably in behavioral science, psychology, clinical psychology, or sociology. Not all universities offer specialized behavioral science degrees at the undergraduate level, so related fields may be the best option. For those interested in behavioral science, coursework should include psychology, sociology, statistics, research methods, and abnormal psychology. Expertise in designing and conducting experimental and survey-based research is very important. A strong candidate ought to develop data analytic skills as well as the ability to write up and present research results in a professional, reader-friendly way. For behavioral scientists, work environments are as varied as their career choices. Many of these professionals work in hospitals and healthcare facilities, or within private companies as consultants, analysts or marketers. Behavioral scientists also work in law enforcement agencies, or in private treatment practices. Academic settings allow behavioral scientists to conduct research and share their findings with the intellectual community; more applied settings allow for research results to be put to use for the betterment of society. According to the Bureau of Labor Statistics, the national average salary for behavioral scientists is $80,860. However, salaries in this field vary widely and are dependent on the specific position held, as well as whether the scientist works for the government or private industry. Generally, those with higher degrees and more years of experience will earn more pay. In most cases, private industry careers offer higher pay and greater opportunities for advancement than public sector or academic positions. Administrative positions pay better than lower-level counseling positions as well. For behavioral scientists, there is a projected 12% increase in employment opportunities through 2024, according to the Department of Labor. This growth is a little faster than the national average for all careers. Are you a professional working in a STEM-related field that would like to volunteer your time for a Master Class? Please contact Neil Schwartz at nschwartz@thehelpgroup.org.